I’m going to let you in on a little secret which is probably not apparent if you’ve been following this blog for a while, or if you’re a new reader. Although nearly 90% of the photographs are from meals prepared in my kitchen, the menus are generally planned a few hours in advance. I usually don’t know what it is I’m making for breakfast, lunch or dinner until I go visit my farmer’s market or, if the weather is lousy like it has been for the past two weeks, my local food emporium. I do try keeping an open mind, so that if I notice something that’s available that’s especially appealing, I can switch out a course without too much trouble. Last night’s appetizer was supposed to have been “insalata di ceci e ruchetta”, or translated to English, “chickpea and arugula salad”. I was all set on making that too, until I realized that I had some mushrooms that needed to be used, which would be perfect with some locally-sourced organic/cage-free/antibiotic-free eggs. By the way, if you’ve never had an egg from a local farmer’s market, you’re missing out, as the flavor is 180 degrees from that of a typical supermarket egg. Yolks are brighter, egg whites are firmer, and the taste is literally ‘essence of egg’. Part of this blog’s mission is to pierce the notion that “cooking is difficult, therefore it’s not for me”. I feel that our pre-occupation with food as entertainment (which is noticeable if you watch programs like Top Chef) is one of the main reasons why increasingly, more people think that ‘cooking is complicated’. While there are certainly ways to make a recipe more complex, I feel that doesn’t usually result in a very interesting outcome. Nine times out of ten, you’ll end up with a creation that’s ‘complicated’ for its own sake, but it won’t be nearly as delicious if you’d have let things alone. If cremini mushrooms are unavailable, substitute regular white button mushrooms instead. This salad is simplicity defined. The hot yolk emulsifies with the vinegar and olive oil in the dressing, which coats the greens while simultaneously wilting them. It’s a terrific, delicious appetizer that’s packed with flavor, and a sure winner in my book. Warm 2 tablespoons olive oil in a large skillet over medium heat. Add the mushrooms, along with a small pinch of sea salt and black pepper. Sauté the mushrooms until they begin to brown and are tender, about 5 minutes. Transfer the mushrooms to a small bowl to cool. In a large bowl, toss together the arugula, fennel and cheese. In a small bowl, whisk together the red wine, red wine vinegar and shallots. Whisk in 1/4 cup olive oil. Taste for salt and pepper. Toss enough of the vinaigrette into the salad to lightly coat the greens. Divide among 2 individual serving plates. Spoon the mushrooms onto the salad greens. In a large skillet (or if you like, the same pan you cooked the mushrooms in), warm the remaining 2 tablespoons of olive oil. Crack the eggs into the skillet. Lightly sprinkle each with sea salt and black pepper. Cook the eggs over medium-low heat until the whites are set, about 4-5 minutes. When the eggs are done, transfer them to each of the salad plates. Sprinkle each plate with additional grated cheese, if desired, and serve at once. 12 Feb	This entry was published on February 12, 2013 at 4:11 pm. It’s filed under American cuisine, cooking, food, food photography, Gluten-Free, recipe, vegetarian, winter and tagged American cuisine, appetizer, arugula, egg, fennel, food photography, gluten-free, salad, vegetarian, winter. Bookmark the permalink. Follow any comments here with the RSS feed for this post. Now this sounds YummY enough to make me forget Ted Nugent will be at the State Of The Union tonight. Thanks Stash. I sure need distractions!!! 😎 Enjoy your day. 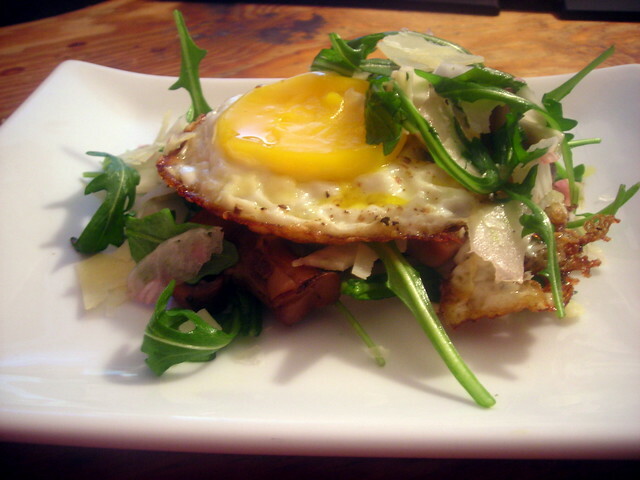 yum… I have such a love affair with eggs! This looks delicious, can’t wait to give it a try. Cool. Let me know how it turns out.